What is the typical size of a surgical table and what are the parameters of the range of height settings on the table? Surgical tables are designed for practical purposes as well as to be security to safely hold patients in the desired position while in surgery. There is some variation in different options of tables depending on the features offered in the table and the overall design. Most surgery tables will be 19 to 20 inches in width and from 79 to 83 inches in length. There are some tables that are designed to be wider to accommodate larger patients but these are usually only used in specialized operating theaters and practices, typically with bariatric patients. Most tables will adjust to low ranges of 31 inches and higher elevations of up to 40 inches or more. Some tables have a variety of different ranges for other settings such as the Trendelenburg and reverse Trendelenburg positions, lateral tilt, leg and back rest as well as the actual head rest, but this does not affect the overall height and positioning of the table. What are the most important features for selecting surgical tables for smaller clinics where a variety of surgeons and medical staff will be working in the same operating suite? In smaller clinical settings and hospitals the versatility of the surgical table is critical to avoid having to have numerous surgical suites and table options. In the situation where a variety of different procedures will be performed on one table choosing the model with the greatest flexibility is the most important. Look for tables that provide a split leg design that will accommodate a wider range of patient positioning without difficulty. In addition tables that have a maximum range of additional features or standard accessories that come with the table package can help to save money. Look also for tables with at least a one year manufacturer's warranty on all parts. If you do want to customize the table with regards to features or upholstery colors it may be important to order ahead and you may have additional costs with upgrading or changing specific aspects of the table that have to be custom made. 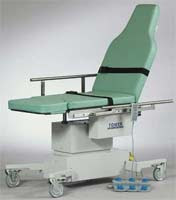 What additional features typically come with a basic or more deluxe model of surgical table? The standard accessories that come with a standard and deluxe type of surgical table will vary based on the manufacturer as well as the specific table type and package. Most of the universal tables will include components such as a head rest, two shoulder supports, two arm boards, two stirrups and two leg rests. Additional components may include lateral supports, anesthesia screens and additional clamps that are supplied with the table. Other tables may include fewer standard accessories which may need to be factored into the cost of purchasing a basic model over a deluxe or universal model of table. Shopping online and when surgical tables are on sale can also allow you to get more table for your budget.